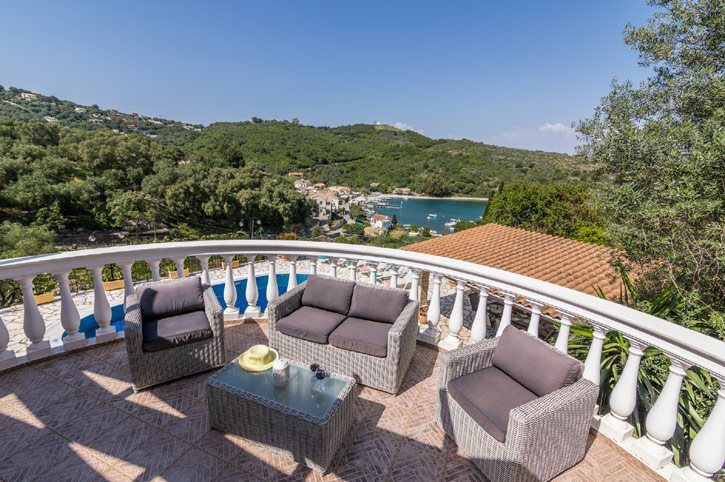 Perched on the hillside above the upmarket resort of Agios Stefanos, Villa Bolovinos has magnificent views of the village's harbour, beach and surrounding hillside. A pleasant 10 minute walk through the olive trees will bring you to the resort's shops and waterside tavernas, as well as its small pebble beach. If you prefer to relax at the villa, you'll have a fantastic BBQ and alfresco dining area, a private pool and sun terrace, and 3 en suite bedrooms. Air conditioning/heating in the bedrooms, pool heating and WiFi are included. The ideal combination of spectacular views, a great location and a high quality finish - a great choice! The villa's private kidney-shaped swimming pool is surrounded by a spacious crazy-paving style sun terrace, with views over the olive groves to the cove below. To one side of the terrace is an impressive covered BBQ and dining area, perfect for enjoying freshly cooked meals on warm sunny days. There's a private parking area in front of Villa Bolovinos, with steps leading up to the entrance. The open plan living space has 2 sets of patio doors keeping the villa fresh and bright, opening onto the pool terrace. There's a table and chairs, a spacious well-equipped kitchen with traditional wooden units, and a circular lounge area with comfortable seating and a flat screen TV. Adjacent to the living area is a twin bedroom with an en suite bathroom. Winding wooden stairs lead up to the remaining bedrooms on the first floor. There's a second twin bedroom with an en suite shower room and a double bedroom with an en suite bathroom. Both bedrooms share access to the large first floor terrace, which has the best view in the house! The terrace has a small seating area which overlooks the pool below, across the hillside to Agios Stefanos bay. This villa is registered and licenced by EOT Greek licensing association. This number is: 0829K10000332000. Villa Bolovinos sits on the hill overlooking the harbourside village and beach of Agios Stefanos. The villa is ideally located making the most of the view, but it's also only a 10 minute walk downhill into the resort. Agios Stefanos has a few small shops and a handful of tavernas by the harbour, leading into the beach. The resort is only small but has everything you'll need for a relaxing break. Plus, plenty of things to do and places to see, including larger beaches, are within a short drive. Agios Stefanos has a few small stores selling food, as well as shops offering gifts and beach accessories. Corfu Town is easily reached by car and makes a fantastic day out, browsing the shops and market stalls. It has a traditional farmers market open every Monday to Saturday morning, as well as many quaint little souvenir shops, high end boutiques and even a Marks and Spencer's! There is a selection of Greek tavernas down by the seafront, a short walk from the villa. During the day you can relax by the harbour or beach and enjoy a meal of traditional meze dishes and fresh seafood. The tavernas have a great atmosphere in the evening too, with lights from the villas on either side of the bay twinkling in the distance. The harbour at Agios Stefanos merges with its small, pebbly beach which has a good beach bar right by the water. Larger beaches, such as Kerasia and Avlaki, are within a short drive too. Children will love paddling in the sea, or playing beach games which can be found at the shops within the resort. The island also has 3 waterparks, the nearest being Hydropolis, 30 minutes' drive along the North Coast at Acharavi. The largest waterpark, Aqualand, is almost an hour away, towards Corfu Town. Corfu is famed for its wonderful scenery, which is particularly stunning at Paleokastritsa and Mount Pantokrator - 2 of the islands' highest points. There are also various small villages to be explored, including Old Perithia which has a handful of lovely cafes open to visitors in the summer. Or, why not venture to Corfu Town? The island's capital, Corfu Town is great for shopping and dining, plus there's a picturesque marina and a fortress. The Liston - the large building in the centre of the town lined with bars and restaurants - is particularly worth visiting, especially at night when the nearby fortress is lit up. There is 1 golf course on the island, an hours' drive away, in the area of Ermones. A great way to see the island if you prefer not to drive is to rent your own motorboat for the day and explore Corfu's hidden coves and other resorts along the coast. Villa Bolovinos is not available to book for season as it is sold out. Take a look here at the Corfu villas that are currently on sale. The tiny picturesque island of Pontikonisi (or Mouse island) and the nearby convent of Vlacherna has become a symbol for Corfu appearing on almost all promotions for the island. With its tiny miniature Byzantine chapel set on top of the little tree covered island it is a pleasant place to visit and can be reached by local boats that do regular trips from Kanoni. At the far north of the island completely hidden from the sea is the large, almost abandoned village of Old Perithia. With seven churches, a good schoolhouse and numerous old houses old Perithia was clearly a thriving and prosperous town in years gone by. Through the years it was gradually abandoned and in a recent EU scheme it is slowly being restored as a living village. The scenery and architecture of the area is lovely and there are three good tavernas and refreshingly, little else. Many houses in Old Perithia are for sale, at very reasonably prices, by the local authority. However, there is a catch - you have to restore the house to its former glory!